Thrilling Rose Bowl Game Presented by Northwestern Mutual Delivers Monster 14.8 Rating; Both College Football Playoff Semifinals up Significantly Year-Over-Year; ESPN Delivers Highest-Rated New Year’s Six Ever - ESPN Press Room U.S.
ESPN’s presentation of the College Football Playoff Semifinals at the Rose Bowl Game Presented by Northwestern Mutual and Allstate Sugar Bowl delivered monster ratings and significant year-over-year ratings increases driving ESPN to its highest-rated presentation of the New Year’s Six Ever. ESPN’s presentation of the College Football Playoff Semifinal at the Rose Bowl Game Presented by Northwestern Mutual featuring a thrilling showdown between Oklahoma and Georgia (5 p.m. 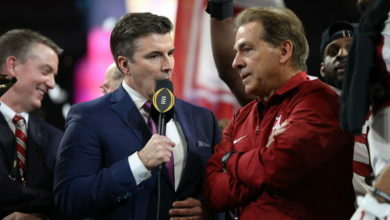 ET) on New Year’s Day delivered an impressive 14.8 overnight (ESPN + ESPN2), up 29% from last season’s first CFP Semifinal on the same two networks and 53% from the 2015 season’s first CFP Semifinal, also on ESPN and ESPN2. This year’s Rose Bowl Game on ESPN-only delivered a 14.2 overnight. The rating for the Georgia victory nearly matched the much-anticipated, record-breaking inaugural CFP Semifinal at the Rose Bowl Game (Jan. 1, 2015), which remains the highest-rated CFP Semifinal to date (15.5 overnight). The Allstate Sugar Bowl between Clemson and Alabama (9 p.m.) delivered a very strong 12.5 overnight (ESPN and ESPN2), up 19% from last season’s second CFP Semifinal, also on ESPN and ESPN2, and 26% from the 2015’s season second CFP Semifinal on the same two networks. The ESPN-only presentation of the Sugar Bowl delivered a 12.0 overnight. This season’s two CFP Semifinals averaged a 13.9 overnight, up 26% from last year and 42% from the 2015 season. Individually, both games rank as the third and fourth highest-rated CFP Semifinals ever, trailing only the two record-breaking CFP Semifinals from the inaugural year. UCF-Auburn Chick-fil-A Peach Bowl Posts Highest-Rated Non-CFP Semifinal Peach Bowl of New Year’s Six Era The Chick-fil-A Peach Bowl between UCF and Auburn (12:30 p.m.) earned a 5.1 overnight, the highest-rated non-CFP Semifinal Peach Bowl in the New Year’s Six Era. The game was up 28% from the 2015 season game and 55% from the 2014 season game. The 2016 Chick-fil-A Peach Bowl was a CFP Semifinal. ESPN’s presentation of the entire New Year’s Six averaged an 8.4 overnight, the highest rated New Year’s Six in the system’s four-year history. This year’s presentation of the six games was up 8% from last year, 15% from the 2015 season and 3% from year one. Outback Bowl: Michigan vs. South Carolina (Noon, ESPN2) delivered a 3.1 overnight, up 72% from the 2015 Outback Bowl, the last time the game aired on ESPN2. The Allstate Sugar Bowl kicked off on ESPN2 and was joined in progress on ESPN at approximately 9:22 p.m. The game was presented on both channels beginning at 9:38 p.m.